A trigger spring is placed behind the trigger of a firearm so that when the trigger is pulled, it'll return to it's original position once the user releases the trigger. Due to various firearm designs over the years, there are many types of trigger springs as there are various types of triggers as well. Some may be compression, torsion , or double torsion springs. Usually, when it comes to compression trigger springs, there is a hammer which pushes up on the trigger spring when the trigger is pulled; so once the trigger is let go of, the spring pushes back on the hammer, causing the trigger to return to it's original position. 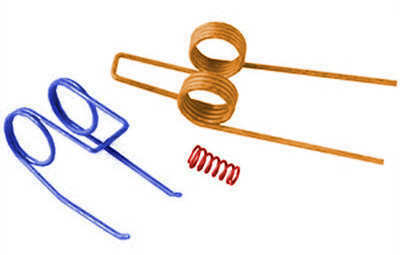 To the right, you will see some examples of various trigger springs. Each type of trigger mechanism has its own benefits. The single action trigger was the first type of trigger used. This has the shortest, slightest, and smoothest pull and it's mechanism is the least complicated. The pull is also constant from one shot to the next so no adaptations in method are needed for appropriate precision. Double action triggers give users the capability to fire the gun wether the hammer/striker is cocked or not. This characteristic is suggested for military or self-defense firearms. 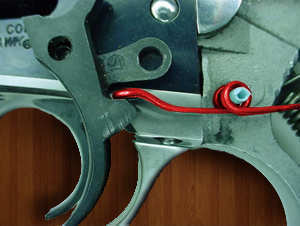 The main inconvenience of any double-action trigger is the additional distance the trigger must be pulled and the additional force needed to conquer the spring tension of the hammer/striker. Double Action and Single Action firearms are adaptable. These guns usually have a manual safety that may or may not be used to decock the hammer/striker. Some have a decocking bar and a manual safety as well. The inconvenience about these is that these bars are frequently intermingled with other bars like take down bars or slide releases with variables that may become confounding. Another inconvenience about these is the different pulls from the first double action pull and the following single action pulls. For more information on Acxess Spring's gun spring capabilities, visit the rest of our Gun Spring pages!